For what you are going to be using the skis for the Nomad RKR is certainly a great ski for you. It is energetic and will ski anything on the mountain. It was one of my favorite skis along with the Bacon. The Bacon is mounted closer to center and is a softer ski than the RKR. The RKR is a one ski do everything ski that is playful and energetic, yet when screaming down the face of a hill is very damp and sticks to the snow. You will really enjoy the ride of the RKR. Adam-Thanks for your prompt reply and advice.Your comments reinforced my leanings-so the RKR it is. Now if we can only put last season’s conditions behind and return to a more typical snow year for the sake of us all! P.S Are you sure you didn’t know I had already ordered the RKR from Al’s? Either way,I can’t wait to get on them. That’s all any of us want is just a typical snow year and we will be happy!! PS: You know I know everything that is going on around here :), but you also know that anything I say Bruce is also going to say the same thing! We couldn’t believe the difference from the Nomad to the Nomad RKR, I didnt even buy the Nomad this year because of how fun the RKR version was. Hi Adam. I am a 5’9″ female and ordered the 171 Nomad RKR. I read your review and said you can ski this ski longer. I am worried the 171 will be too short. I will be mounting an AT binding on them and using them for backcountry primarily. Right now I ski a 170 Volkl Gotama and they are actually longer than the Nomad RKR when I put them next to each other. Of course, the Gotama is a very low profile rocker. Any thoughts on if you think a 171 is too short? I am replacing a decade old pair of World Piste (might be older). I am looking at this ski and the BD Revert. I’d welcome thoughts on a comparison. I get one ski and ski it in all conditions here in CO. I am mostly front side, but with the kids getting older, I am hoping to get more time out of bounds. The Nomad RKR is certainly an amazing ski and it is hard to pick away from it as it really will do anything in every kind of condition and is quicker edge to edge than the BD Revert. Can anyone compare these to scott punisher and kästle west xx110? Adam…thanks for the nice review. Any thoughts on how the Nomad RKR compares with the RMU Apostle? I did not get any time on the RMU but I have friends that have skied it and have said they ski very similar but the RKR is slightly quicker edge to edge the RMU likes to charge bigger turns. Thanks for all the great info! I’ve just received the 171 Keeper as an early Christmas gift. Though I’m tempted to get them mounted up and go for it, I’m a bit nervous that they might be too much ski for me. 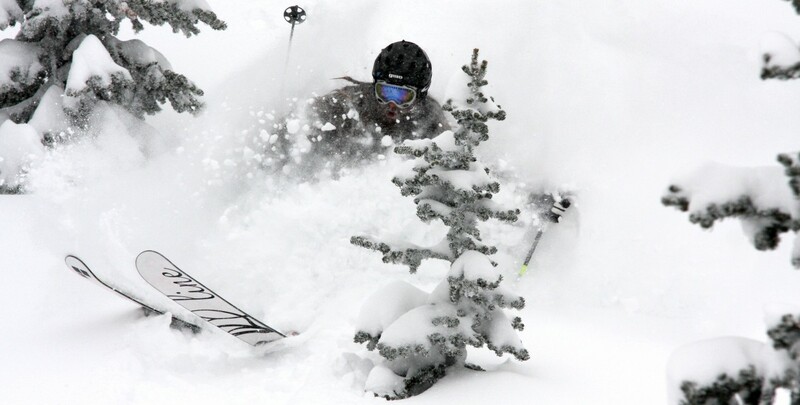 I’m 5’1″ 110lb aggressive, expert female skier.. but this ski is much bigger than anything I’ve skied before. I’ve previously been on K2 Obsethed, Seth Pistols and Volkl Kiku. Any advice? Would the Nomad be a more realistic option for me or is the Keeper doable? You can’t go wrong with either ski. I loved the Keeper and although it looks like a big ski it certainly does not ski as big as it looks. It skis much shorter because of the overall design of the ski, unlike with the Obsethed or Pistol which did not have the early taper of the Keeper. Nomad is actually a stiffer ski than the Keeper, but they are both certainly hard chargers.